Dyna-Flo's durable full-width bed of staggered polypropylene wheels is the perfect option for multiple, changing SKUs. Dyna-Flo carton flow is easy to assemble with 12"-16" tracks that drop directly into pallet rack. Dyna-Deck is a replacement system for damaged carton flow rails and wheels. Heavy, abuse-resistant low profile tracks, available in 12″-16″ widths, drop easily into existing carton flow shelves to form a solid wheel bed solution. Rack-Trak wheeled tracks are designed to drop onto step-beams for quick, easy pallet rack conversions. Self-tracking lane assemblies are available in custom rail spacing configurations to meet all application requirements. Cart-Trak's full-width roller carton flow is a heavy-duty, abuse-resistant system providing full case coverage and superior flow for consistent case and tote sizes. Tracks drop into existing pallet racking and are virtually maintenance free. Econo-Flo carton flow is an affordable, versatile system of wheeled tracks created for lighter-duty order picking applications. Tracks pop into place providing infinite adjustability for changing SKUs. Flo-Guide carton flow uses specialty ABS flanged wheels for custom applications; ideal for tote flow and very deep lanes where full length guiding is necessary. Flo-Guide's patented design separates product while guiding totes and cases. Mallard manufactures the most diverse and flexible line of carton flow products in the industry, designed to handle frequent product mix changes with built-in durability for today’s busy warehouse environments and biggest storage challenges. All systems are custom designed for your unique application requirements and are adaptable to roll-formed or structural racking. Concerned about which design to use? Don’t be. Mallard’s case flow experts will help you develop the right system for your application. We’ll even provide a sample test level for you to evaluate with your product mix on site. Order selection from static shelving or lower level pallet flow rack requires extensive equipment, travel time and labor. 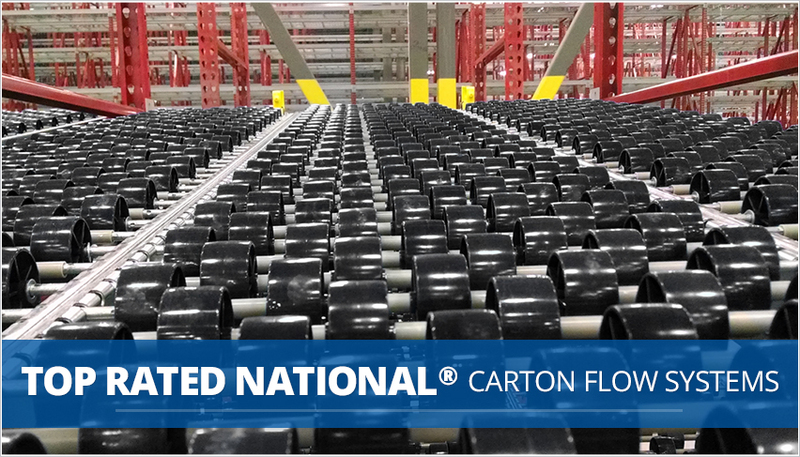 Mallard carton flow provides space saving storage for multiple or slow moving SKUs in a condensed and organized footprint for efficient order selection and proper stock rotation. Product is loaded from the back of the system and flows on inclined rollers/tracks to the pick point in front.